The Humboldt Botanical Garden is all dressed up for the holidays and if you haven't been to see this impressive display of native and diverse plants, there's no better time than the holiday season. Bring loved ones out for a magical walk in the garden at night with luminaries and live music, refreshments and merriment during the Holiday Candlelight Walk on Saturday, Dec. 16 from 5 to 7 p.m. ($10 per adult, $25 for a family up to five, with $5 for each additional child). There will be luminary guided walks, live holiday music and caroling, refreshments and a special children's area where the little ones can visit with Santa, snack on cookies and apple cider, and partake in holiday craft-making, including a Hogwarts Express model railroad. 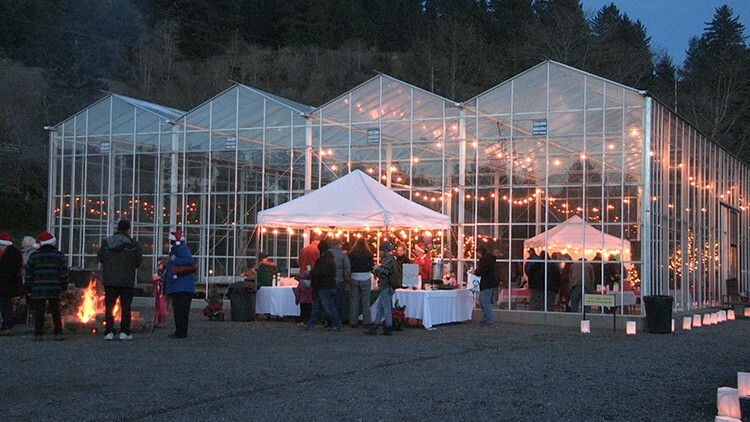 The grounds are spectacularly decorated for this special event with strings of lights adorning the greenhouse and two large bonfires where people can toast marshmallows and listen to music. Mulled wine, beer and hot chocolate are available for purchase, with all proceeds supporting the garden. Bundle up and wear comfortable walking shoes. Gates will open at 5 p.m. and the holiday fun happens rain or shine.